To cloud or not to cloud? That isn’t really the question anymore. In choosing a public cloud service, many businesses are finding that instead of just one cloud, they prefer a crowd. Enterprises face a dizzying array of choices in how to host their IT infrastructure, to find the best combination that matches business needs. Whether you choose to keep your operations entirely in the cloud, or maintain on-premises components in hybrid systems, you don’t have to stick with a single cloud provider. You can spread your resources across multiple public clouds, to maximize performance, features, and cost savings. That’s a strategy that more businesses are adopting every day, either intentionally or as an organic growth of operations. In a recent report by Forrester Consulting 86 percent of cloud technology decision makers surveyed describe their current cloud strategy as multicloud. Your DevOps pipelines will be part of that multicloud solution, and JFrog Artifactory repository manager has given us a peek inside our customers’ approaches. 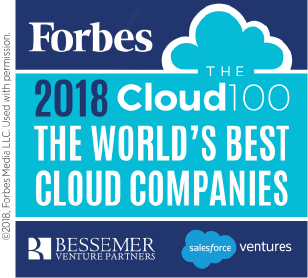 Our work enabling DevOps in the cloud helped inspire Forbes magazine to name JFrog to its 2018 Cloud 100 list of breakout cloud companies. When is one cloud provider not enough? Being multicloud means having more of the right things, like scalability, agility and security. But it’s also more to manage, integrate, and diagnose. So you’ll need to consider your needs before rolling out your roadmap for the cloud. Maximize performance – Devote each workload class to the cloud provider that performs that type of task the fastest. Cost savings – Allocate your cloud use to the most competitively priced for different workloads. Integrate from acquisition – You may need to blend existing pipelines that use different public clouds into a common set of operations following a merger or acquisition. Other considerations might be to gain the best innovations from each cloud platform, load balancing, risk reduction, and redundancy for disaster recovery. Those who do adopt a multicloud strategy embrace it strongly. So much so, in fact, that a 2017 survey by Enterprise Management Associates found that of enterprises using a multicloud strategy, 57 percent report using four or more public clouds. One of the simplest and most common use of multicloud for DevOps is to use one cloud provider for development and test, and another for production. This becomes even more important when you need to support multiple development environments, such as devoting Java application development and test to one cloud provider, with Go development on another. Both might produce containers that are released to a common production environment in yet another cloud. Ideally, in a multicloud environment, developers shouldn’t be thinking about building software for a particular cloud, since there’s no guarantee which cloud their code will eventually run on . They should develop against open source APIs, so that deployments can flow to different destination environments. When developers follow this practice, operations have the freedom to manage application deployments across compute resources from different cloud providers for the most effective combination of performance and cost. This is easy to accomplish with Artifactory. Deployed in each cloud development environment, and also in each of the cloud destinations, Artifactory can be configured to automatically replicate all the software artifacts to each of those environments. In this way, you are guaranteed to have all the right versions of binaries across all cloud destinations. Although each public cloud may be different, Artifactory spreads a consistent artifact fabric across all of them. Containers, with their dependency isolation that allows for consistent operations across different environments, have been essential to the growth of multicloud strategies. Container orchestration tools like Kubernetes help handle their complex deployment across those environments. Artifactory aids this too, especially as a Kubernetes registry for Docker images, i.e., a central repository for what can be deployed to those cloud automation platforms. In addition, Artifactory partners with several cloud providers for easy integration, including the major platforms of Google Cloud, Amazon AWS, and Microsoft Azure. If, like most enterprises, you’re considering adopting a multicloud strategy, or looking to improve or expand the multicloud plan you have, give Artifactory a good look. You could start right now with a free trial – on the cloud of course.